Materials and manufacturing processes have developed over the time. A historical study of product evolution reveals that products have evolved around the availability of materials and processes. Following examples illustrate how development in metal manufacturing technologies influenced product design. 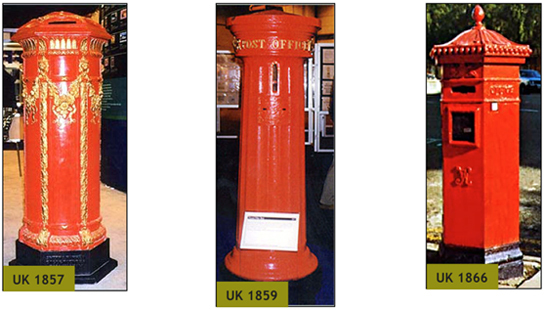 1857 – A cast iron post box made of 15 - 20 mm thick walls. At this time metallurgy was not well developed. This box is not portable due to its sheer weight.By 1859, metallurgy techniques were improved significantly, as is evident from the detailed decorations on the post box. Also the thickness comes down to 4-6 mm. 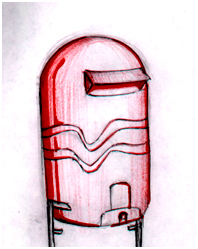 With the advent of newer materials like sheet metal and improvement in manufacturing techniques, the design of the letterbox evolved into a newer form. The last box from 1992 is no longer in cast iron, but in sheet metal. Hence a significant form change is visible because of material and manufacturing process change. 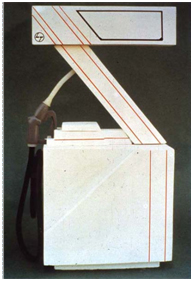 The images show how fuel dispensers’ form & materials have evolved with car form. The car from 1924 is a minimalist means of transportation. So is the fuel dispenser. 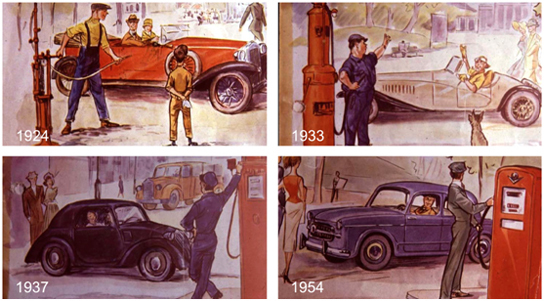 By the advent of 1954, car manufacturing has become more sophisticated. The fuel dispenser is also now made in sheet metal rather than casting. The fuel dispenser body is more boxy similar to the car form. 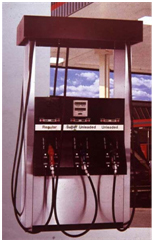 The 1st pump is from USA where the consumer had very sophisticated choices regarding the composition of the fuel they would like to have. Also the prices vary across the choices. The 2nd pump is from Japan, which again sports minimal design that is more contextual to their culture. 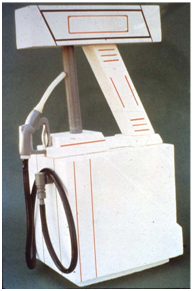 The evolution of fuel dispensers in India is shown below. 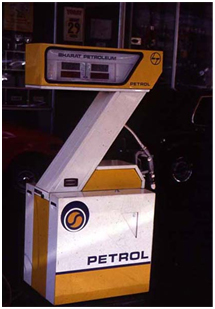 The 1st dispenser is from the late 80s and early 90s, which saw a very simple market demand of petrol and diesel. Also the number of vehicles on road was much less. As the market matured in the country, different grades of fuel came in. Also the increase in the number of vehicles on the road made it essential to have a faster fueling station. Hence a single dispenser now has to handle more number of products. 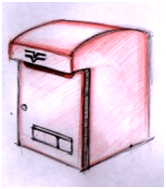 Thus the design evolved as per the need of the market. Through the years sheet metal production in the country started and fabrication facilities cropped up. This influence is also visible in the product design. 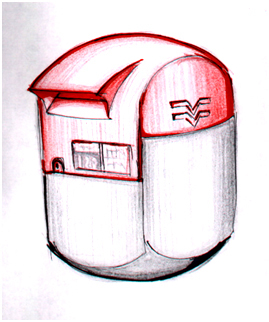 The Oval dispenser shows how branding can be a product design driver. ONGC wanted to show its brand image and market leadership position depicted through the product. Producing the form was possible at a low cost due to manufacturing innovations in the field of welding. Thus it is very important for a designer to know the manufacturing capabilities of his company as well as that provided by the market in which one is operating. This helps to produce best quality product at a competitive price. For example, while the Z-line was being designed in the 1989, L&T possessed high-tech Amada CNC machines, which could produce highly accurate sheet metal components. Similar facilities were hardly available elsewhere in the country. Thus the design of Z-line uses the machine to the best of its capability. It took more than a month to program the machine to make the sloping part. The electronic compartment of the dispenser needs to be water ingress proof. Using gaskets can do this. 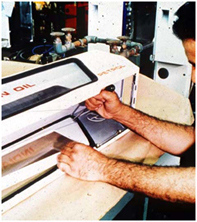 But to manufacture gasket as per the need of the product was turning out to be more expensive. But thanks to the advent of Maruti in the country at that time, a huge gasket manufacturing industry was launched. Thus Z-line used the same gasket, which was very cheap now due to large volume productions, but at the same time was very high quality. The assembly was inspired by the car industry too. 5% cost saving was brought in this way. 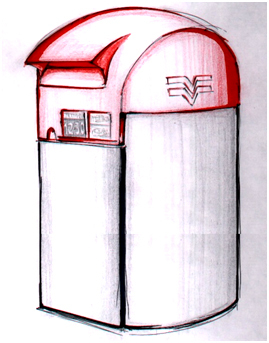 The images below show how considering different materials and processes influences the ideation process for a product. Removal of the wire routing rod from the 1st mock-up drastically changes the formal appeal of the product. But at the same time changes the manufacturing challenges. The pump has both a LED and LCD displaying the same information. This is a very contextual design for Indian market where the pumps didn’t have a top canopy. Hence the LEDs were not visible in the daytime whereas LCDs were not visible at night, as it is not glowing. This was a shock for the international market but very well suited to the local context. The tenders released by the oil companies thus had this basic requirement, which could not be fulfilled by any of the international companies. During the field research, it was observed that one of the pump's display was kept on the floor for maintenance and a scooter hit it and broke it. This insight was used to design this innovative hinge system for the display. The meter is used by pump owners to see the total at the end of the day. Earlier it was placed inside and hence the pump owner had to use a torch and get in to see it. Z-line on the other hand made it user friendly by putting it on the front by using a universal coupling.